Bundesliga | Lahm: "The Bundesliga is as strong as ever"
Lahm: "The Bundesliga is as strong as ever"
Munich - At most clubs, earning two wins from the opening pair of Bundesliga fixtures in a new season would be viewed as a resoundingly successful start to the campaign. Yet FC Bayern Munich are no ordinary outfit, and, especially after last term's trophy clean sweep, their standards are notably higher. Despite having the maximum points on the board at this stage, many observers, and club insiders, have pointed to the increased number of shots on goal the opposition have been afforded (eleven from Borussia Mönchengladbach and nine from Eintracht Frankfurt) as a sign that Pep Guardiola's tactical adjustments have not yet completely sunk in. However, team captain is not overly concerned. "The adjustments come gradually," the full-back said at Bayern's state-of-the-art training complex, set in a quiet, residential suburb in the south of the city. "We're working on the defence as a team, and we only conceded 19 Bundesliga goals last season, which was a record." likewise brushed off the criticism: "It's easy to blame the system when we've suffered from one or two individual errors," said the man who created the winner against Frankfurt. "The removal of one holding midfielder takes away some insurance, but offers us more going forward - we just need to get back to controlling our opponents." Not that this weekend's rivals are likely to roll over lightly, as fellow Bavarians Nürnberg make the short trip to the Allianz Arena with more motivation than most. A derby awaits, and there'll be no holding back on either side. 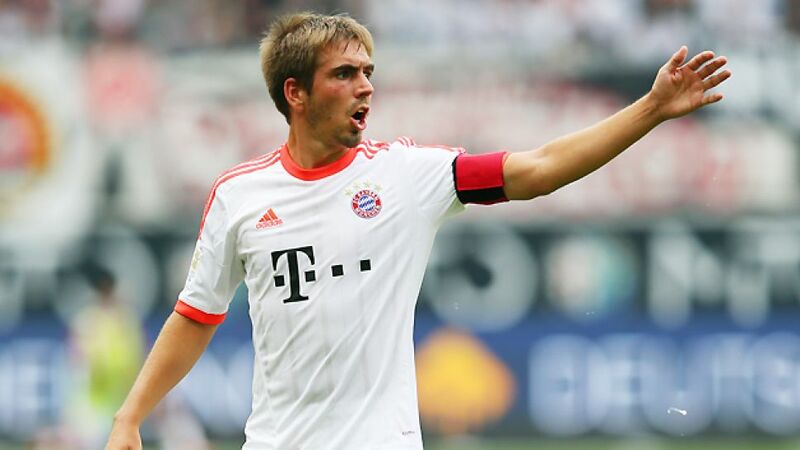 "It's always a special game in Bavaria," said Lahm. "There's bound to be a good atmosphere, and hopefully the sun will shine. I can't wait for it, these are the kind of games you relish as a professional." Last year, the encounter in Nürnberg ended in a draw, one of the only two away games in Bayern's title-winning campaign where they failed to pick up maximum points. Müller highlighted Nürnberg as "difficult opponents who are always unpleasant", and Lahm is aware quite what this game means to the opposition: "They'll certainly be more motivated and well-organised defensively this weekend". The Munich-born 29-year-old also highlighted the widespread quality across the Bundesliga as a whole as another reason why the defending champions haven't had things all their own way so far. "The league's as strong as ever" he said. "We had two teams in the UEFA Champions League final last season, and a good Bundesliga is a good advert for German football. Our teams are feared across the continent and no-one wants to face them because of the Bundesliga's strength. There are other top leagues, but the Bundesliga is definitely up there."